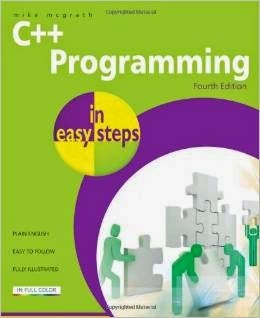 C++ Programming in Easy Steps instructs you how to program in the powerful C++ language, giving complete examples that illustrate each aspect. C++ Programming in Easy Steps makes no assumption you have previous knowledge of any programming language so it's ideal for the newcomer to computer programming. It has an easy-to-follow style that will appeal to programmers moving from another programming language, and to the student who is studying C++ programming at school or college, and to those seeking a career in computing who need a fundamental understanding of object oriented programming.